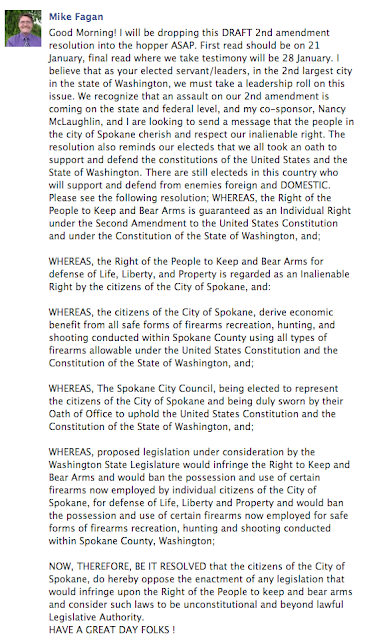 Spokane City Councilman, Mike Fagan, also of the Agenda 21 conspiracy theory, has decided to take a proactive approach and dissuade any state legislator from the notion of addressing gun control which he immediately conflates to infringing on Second Amendment rights. The problem is that our legislature isn't quite sure what it will do yet. Nevertheless, Mike Fagan is not about to wait for what he considers to be an inevitable assault on the Second Amendment. Below is Mr Fagan standing on a United Nations flag during a protest back in March of 2010. Just because his conspiracy theory fears are not credible doesn't mean they're not valid. I remember that night very well, mostly for it's hilarity. Who would've guessed back then he would be elected to the city council. Here's the notice for the protest he led that night. 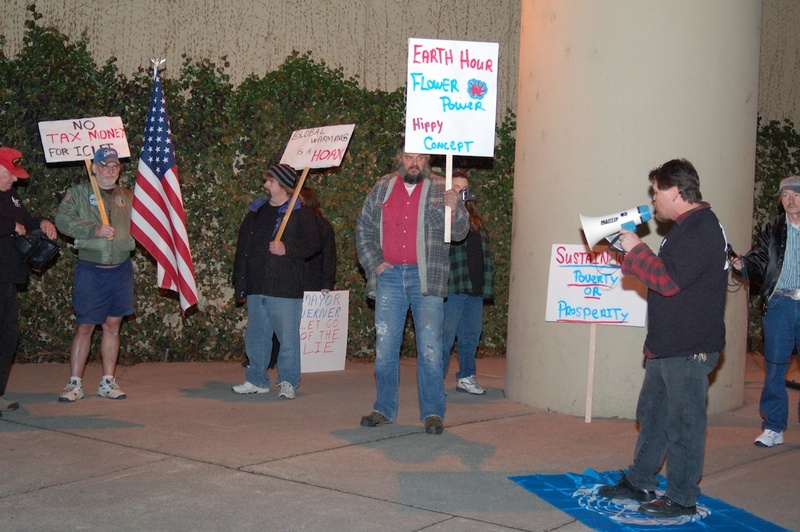 Please plan on joining members of Spokane Patriots, the action driven Tea Party, as they converge on the Spokane City Hall plaza with spot lights and flash lights, in opposition to Mayor Mary Verner's proclamation of "Earth Hour" at 8:30 PM Saturday, 27 March. Earth Hour is a global event to recognize "Climate change", "Sustainability", and conservation. After issuing the proclamation, the Mayor will turn off all the lights in city hall for one hour. Spokane Patriots and many others already support and practice conservation. The fact that the Mayor will be using city resources to perpetuate the falsehood of "global climate change" to advance her sustainability agenda is an outright lie and a slap in the face to the citizens of Spokane. When the lights go out, Spokane Patriots and others will be shinning their spot lights and flash lights on city hall in search of the truth. So bring your flashlights! And feel free to make and bring signs too. The Spokane Patriots will rally at the gondola ticket office at 8:00 PM and then march across the street to the city hall plaza on Post St.
Mayor Verner and the city did not turn off the lights at City Hall at all that night. Mr Fagan posted a draft resolution on his Facebook page today, thus adding his voice to the din that's trying to overwhelm any effort at reasonable legislation to address gun violence. The next time you hear about a shooting of any kind, it's important for surviving family members and friends to remember that the shooter is well within their inalienable Second Amendment rights and people like Mike Fagan are working hard to protect those rights. Why do we never engrave the monuments and memorials of the slain with statements showing our reverence for Second Amendment rights? Have a great day indeed. What If Your Battery Is Dead?